This EA is a straightforward low risk trader. Place the EA to a 1 Minute EURUSD chart and that's it. It operates in the London trading session. Actually 5am - 2pm GMT. This price action robot place a buystop or sellstop order when suits. When the stop order executed, the robot begin to track it's progress and close the position at the right price. Only one position at a time with stop loss. The stop orders expire in 18 minutes. 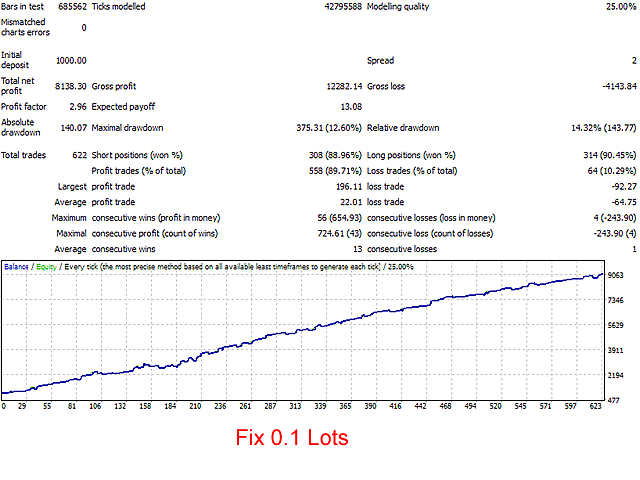 It is a fully automated trading robot, It works without any user interaction. Trade calculations by price action. Profit is protected with auto profitlock. This EA usually close the positions on the same day it's opened, but sometimes holds open positions for days. 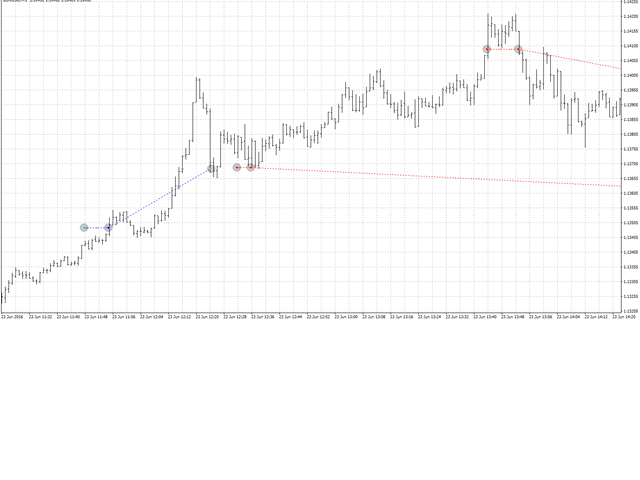 This EA is optimized to the EURUSD pair on M1 chart. In fact it doesn't work profitable on any other charts or time frames with the default settings, but you may find a better configuration. 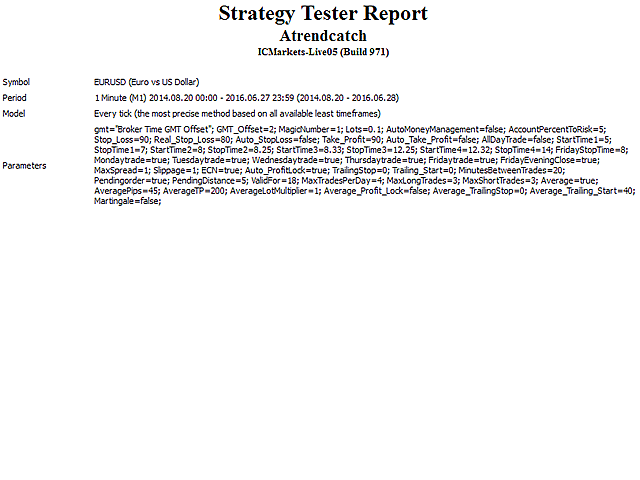 The strategy tester report is achieved with default settings. I strongly advise to use low spread ECN brokers to achieve good results. GMT_Offset - default is 2. Set your Broker's Server Time if it's different. MagicNumber - Unique number to this EA. AutoMoneyManagement - default is false. If true, it overrides Lots. If it is false, trade size will be Lots. AccountPercentToRisk - default is 5. 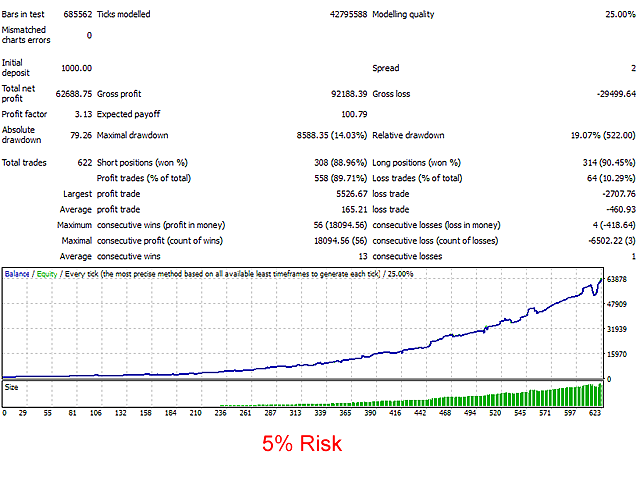 If AutoMoneyManagement is true AccountPercentToRisk calculates your Trading size. Maximum risk allowed by the Robot is 20% of your Free Margin. Stop_Loss - default is 90. Real_Stop_Loss - default is 80. This hidden from the Broker. Auto_StopLoss - default is false. Take_Profit - default is 90. Auto_Take_Profit - default is false. MaxSpread - default is 1. The Robot will not open positions, if the current spread is greater than the set maximum. Slippage - default is 1. The Robot will not open positions, if the price difference is greater than the set maximum. ECN - default is true. The Robot will send Stop Loss and Take Profit values to the server after the position is opened. Set it false if your Broker is not require it. FridayEveningClose - default is true. Positions closed Friday 7 pm GMT if in profit. Otherwise held. Set it false if you want open positions held over the weekend regardless. Auto_ProfitLock - default is true. TrailingStop - default is 0: No trailing stop. Trailing_Start - default is 0. Average - default is true. Some don't like it, but with this Robot, it works. It adds only one position to the trade if the trade is in the red and the Robot determines that it is appropriate. AverageLotMultiplier - default is 1. The Lot size of the Average can be multiplied relative to the original trade. Max value is 2. Martingale - default is false.